Longing to take a family foray into the Middle East? Jordan calls! Just a stone’s throw from North Africa and the Mediterranean Sea, this compact country is overstuffed with world wonders, historical marvels, stunning natural landscapes, urban bustle and high-octane adventures. We caught up with our friends at Tourist Jordan for their take on all the reasons Jordan should claim a top spot on your vacation wish list. Tempted? Us too! What are the major reasons for families to choose Jordan over other Middle Eastern countries for a family vacation? For families interested in visiting the Middle East, Jordan continues to remain a popular choice. Jordan has recently seen a spike in tourists and is eager to host more visitors, aiming to reach at least seven million by 2020, according to the Minister of Tourism and Antiquities. Due to the influx of international visitors, Jordan is committed to providing excellent hospitality and promoting safety in the region. Jordanians are some of the warmest and most welcoming people in the world, famous for their generosity and hospitality, and visiting families can feel this sense of reception. Beyond this, Jordan holds some of the world’s most famous and alluring attractions, including one of the Seven Wonders of the World: the lost city of Petra, also a UNESCO World Heritage Site. Filled with ancient history and many well-preserved ruins, Jordan is a progressive and democratic country and maintains its historical roots but keeps an eye on the future. Jordan is filled with family-friendly hotels, resorts, sites and attractions for children of all ages. Want help booking a family vacation to Jordan? When is the best time of year to come, and how long should visitors spend to get a good taste of what Jordan has to offer? Jordan has over 300 sunny days a year, making it an ideal destination year-round. One of the best times of year to visit is during the spring (between March and May), as temperatures are comfortable. During the summer months, the heat can become extreme, which can be challenging when traveling with little ones. In the spring, families can expect warm days, ideal for swimming in the Red Sea in Aqaba or floating in the famous Dead Sea. Spring evenings tend to be cooler but comfortable. What might a basic itinerary look like — would you begin in Amman and then head farther afield from there? Flying into Queen Alia Airport in Amman, families can get situated and acclimatized with the first day in [town]. Amman offers plenty of attractions, including the Roman Amphitheater, the Citadel, and the Jabal Al Lweibdeh neighborhood. Families can then head to Petra, Wadi Rum, Aqaba, Jerash, Madaba and Mount Nebo, some of the most fascinating and alluring sites in the Hashemite Kingdom. Most people are familiar with Petra. What lesser-known Jordan highlights would you suggest? Petra is a must, without question, and should be on every traveler’s bucket list. The Dead Sea is also a must for families and offers a once-in-a-lifetime experience of weightless floating in the salty waters of the lowest point on earth. Beyond this iconic site are places like Wadi Mujib — the spot where the Jordan River flows into the Dead Sea, offering a rocky crevasse for adventure hiking and exploration. There is an age restriction, however; it is ideally suited for families with children 15 and up. The Ma’in Hot Springs are a lesser-known attraction ideal for families, where both public pools and private spa pools are available. Families can relax and enjoy the healing properties of the natural hot springs on a day trip or enjoy a night spent in the nearby hotels. Jordan also has a multitude of nature reserves and parks protected by the Royal Society for the Conservation of Nature. Places like the Dana Biosphere Reserve, Azraq Wetland Reserve and Ajloun Forest Reserve provide families with meaningful experiences connecting to and understanding the land and the history. Families can see endangered species, most specifically gazelles, the Arabian oryx, ostriches and Persian onagers. 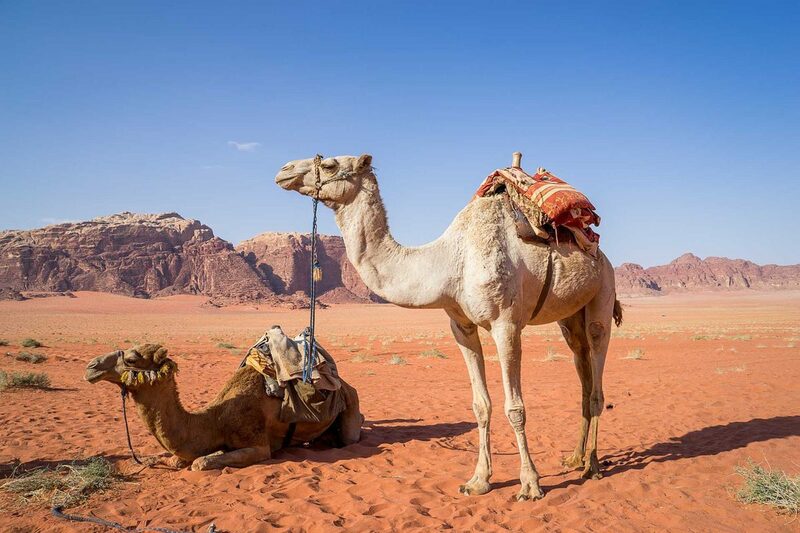 Another must-have experience when traveling in Jordan is spending time with the local Bedouins, the nomadic community that lives in the Wadi Rum Desert. Families can spend an evening under the stars, sleeping in tents and engaging with the local community to understand a different way of life. Families may also be interested in spending time in Aqaba. Situated along the Red Sea, there are many family-friendly resorts, with plenty of pools, buffets and family rooms available, a perfect way to unwind after adventures and sightseeing exploration. Are there any kid-specific attractions or events? Yes! One of the best kid-specific attractions in Jordan is the Children’s Museum, a dedicated space that offers both permanent interactive exhibits and rotating exhibits that are hands-on and child-centric. The Children’s Museum is great for little ones, and ideal for children 1 to 12 years of age. It is both educational and fun, sparking creativity and curiosity. The Royal Family’s Auto Museum is also a great place for families, appealing both to adults and children. It showcases an extensive collection of automobiles and motorcycles, most belonging to the Royal Jordanian Family. Other family-friendly areas include the famous Rainbow Street, perfect for afternoon strolls or checking out the many souks (markets). Is the country easy to navigate by public transport, or do you need to rent a car? While there is public transportation, it can be difficult to navigate, especially when traveling with children. Car rental or using taxis is an acceptable and safe method of transportation. Joining group tours is an excellent way to see many of the sights and have access to safe transportation with English-speaking drivers. Organized tours are also a way to access knowledgeable guides and meet other travelers. What would you say to families who might be concerned about safety in the region? Jordan is a progressive country that sticks to its history and cultural roots but maintains stability and strength in moving forward. While some may have certain preconceived notions of the Middle East, Jordan is a very safe country for tourists and has great relations with neighboring Israel, with many travelers passing between the two countries at the border crossings. Jordanians are eager to welcome international visitors and want to encourage tourism; as a result, the country has made a great effort to ensure safety and maintain peace with the collective goal of international tourism. Jordanians are welcoming, approachable and kind people who welcome foreign visitors happily. What things might surprise families visiting Jordan for the first time? Many visitors have one vision of the Middle East and are surprised when Jordan exceeds or differs from their expectations. Jordan is a diverse mix of old and new, showcasing historical sites and traditional ways of life, yet is extremely forward-thinking and modern. There is a vibrant and booming art scene, some of the best cuisine (including a budding vegan community) and some of the kindest people. For a memorable and meaningful family vacation in the Middle East, Jordan is sure to check many items off the bucket list. Editor’s Note: Photos by Tourist Jordan.